Price sensitive perspective...we give you options! Capabilities: Every fleet requires special needs. We can handle them all! Contact Us today if you need help for something we don't list here. We employ Technicians who have proven themselves by achieving the highest recognition in the automotive field, ASE Certified Technicians. You deserve nothing less. If your business owns many vehicles then you know how difficult it is to keep all of them working 100% of the time. 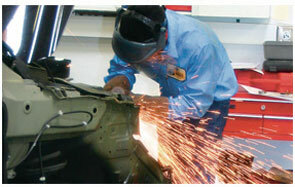 Sturken Auto Body Auto and RV Repair is here to assist you in keeping your fleet running at top performance. Peace of mind! We keep track of your maintenance needs so you don't have to! We're a fifty year business driven by a passion for excellence. Let us handle your fleet so you don't have to. To obtain a copy of our credit application, please click here.